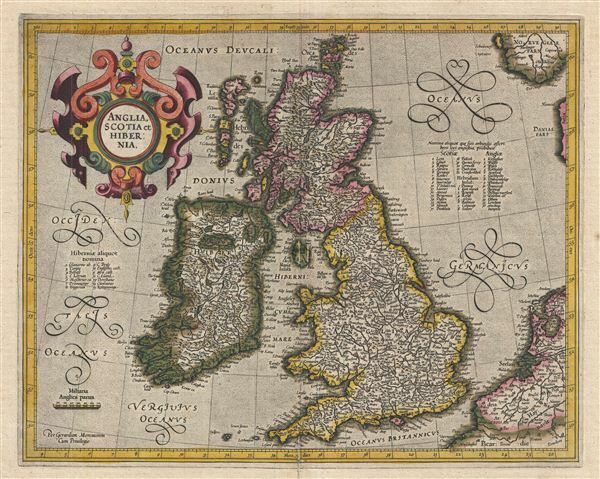 A beautiful old color example of the Mercator Hondius map of the British Isles. This map was first issued in 1595, one year after Mercator's death. Mercator's plates were acquired by Jodocus Hondius who, in 1606, issued the first Mercator-Hondius edition of the Atlas. The present example represents the 1613 edition prepared by the younger son of Jodocus Hondius, Jodocus Hondius II. Cartographically the map is little changed from its 1595 issue. The cartographic design of the map is based on the maps by Saxton (england and Wales), Lawrence Nowell (Ireland), and Mercator's own earlier work (Scotland). The map features a baroque strapwork title cartouche in the upper left quadrant, florid lettering, and stippling in the seas. This map would remain the definitive map of the British Isles for many years. Hondius, Atlas, (Amsterdam) 1613 (1:112). Good condition. Some verso repair and reinforcement on original centerfold with some minor damage to lower margin. French text on verso. Van der Krogt, P., Koeman's Atlantes Neerlandici, 5000:1A. Moreland, C., and Bannister, D., Antique Maps, a Collector's Handbook, page 209. Shirley, R., Maps in the atlases of the British Library, 180.